PAUL KLEIN TTN (Left to right) Seniors defender Tiia Kuokka, forward Becky Bently, forward Niki Conn, defender Samantha Farlow. The Owls’ closed out their final weekend of play with four points. Senior forward Niki Conn saw her soccer career in a Temple uniform come to an end after the Owls wrapped up their season with a double-overtime thriller against St. Bonaventure that ended in a scoreless tie on Sunday. Last Friday the Owls snapped their three-game losing streak with a 1-0 win against Duquesne at home. Sophomore defender Karly O’Toole scored the lone goal on a penalty kick after Conn drew a call in the box. The shutout was the Owls’ fourth of the year and most since 2006. But, Sunday was a game in which nobody could find the back of the net. The Owls were playing at La Salle for their Senior Day game instead of their usual home venue at Ambler Sports Complex due to inclement weather. Solid defense and a few clutch stops from redshirt-junior goalkeeper Tara Murphy kept the Owls in the game and gave the offense a chance to win in their final game of the season. Despite 17 shots with 10 of them from Conn, Temple was unable to beat St. Bonaventure’s sophomore goalkeeper Megan Junker, who recorded eight saves. 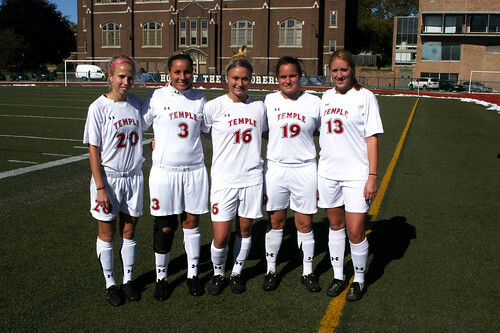 Conn was one of five seniors to play her last game in a Temple uniform, the others being forward Becky Bently and defenders Amanda Vogelman, Tiia Kuokka, and Samantha Farlow. “I love playing soccer and I loved the people I played with. It doesn’t get better than that,” Conn added. Conn, who may return as a forwards coach next year, left a legacy behind. Conn led the team in goals during her four-year career. When asked to assess the season for his Owls, Gwilliam didn’t hesitate to state the obvious about the way his first season went with Temple. Although the season is now over, Gwilliam said there is work to be done with a team that has had some kind of a losing stigma in recent years. The biggest task that this team will face is replacing the leadership of this group’s seniors, including Conn.
As far as next season is concerned, the way that this season played out will certainly fuel the fire for next year’s team. “Every member of our team is dedicated to being successful and we’re going to do it. The work starts now,” Gwilliam added. Drew Parent can be reached at andrew.parent@temple.edu. Seniors hope to inspire young team under new coach.